(travel with Qatar Airlines or Gulf-Air ) Transfer TIA airport to your Bouddhanath Stupa Guesthouse/ Rabsel guest house. Morning visit to the Bouddhanath Great Stupa and surrounding Gompas (monasteries), afternoon lecture with a Tibetan Doctor (Amchi) and a Lama on the concepts and practices of Himalayan Traditional Healing, Divination, Rituals and Guru Rimpoche and Secret Treasures "Termas" traditions. Review of the different resources and itineraries. Day 04: Morning visit of Kathmandu city and introduction to several KTM valley temples and powerplaces, ie: Patan, Swayambu Stupa, Pashupatinath. Afternoon: visit of Traditional Arts Handicrafts and Painting. Evening lecture on the KTMValley Sacred Mandala, including description of related Rituals. Day 05: Day excursion out of KTM valley, to Dashinkali and Pharping and guided introduction of Guru Rimpoche caves. Evening optional lecture either on: Tibetan Nyingma related teachings and practices of Guru Rimpoche Secret Treasures "Termas", and/or a Nepalese Djankris (Tamang) or Gubajus (Newars) Shamanistic Ceremony. Day 11: Visit to a Lama with activities such as ceremony or Handicraft..
Day 12: Day free or continuation of options. Evening, special Tamang Shamanic music and traditional dance. Day 14:Transfer to TIA and Fly back to UK. Kathmandu Valley is often known as being a Nepal Mandala, surrounded by powerplaces. A mandala is a circle, part of a mystic diagram of varied architecture, being used in rituals or meditation practices. In the ancient Indian usage it also signified an administrative unit or a country. From at least the sixth century A.D., in conjunction with the word "Nepal"
Mandala signified to the Nepalese the Kathmandu Valley and surrounding territory. (ref- Mary Slusser, 1982,). The elliptical valley bowl is about fifteen miles in length and twelve miles in width. It lies at an average of four thousand five hundred feet above sea level and is surrounded by forested peaks up to nine thousand feet in height. The rich lacustrine deposits that fill the valley bottom have been eroded by its fast flowing monsoon rivers - particularly the Bagmati and Bishnumati - to form steep sided hills and ridges, some still covered by trees, that border the swaths of terraced paddy fields. Three cities dominate valley life: Kathmandu in the west, Patan in the south and Bhaktapur in the east. Kathmandu, the capital of the Hindu Kingdom of Nepal, is now the centre of the Valley's high-density population of about one million people. Traders and artisans still form a significant proportion of the urban inhabitants. 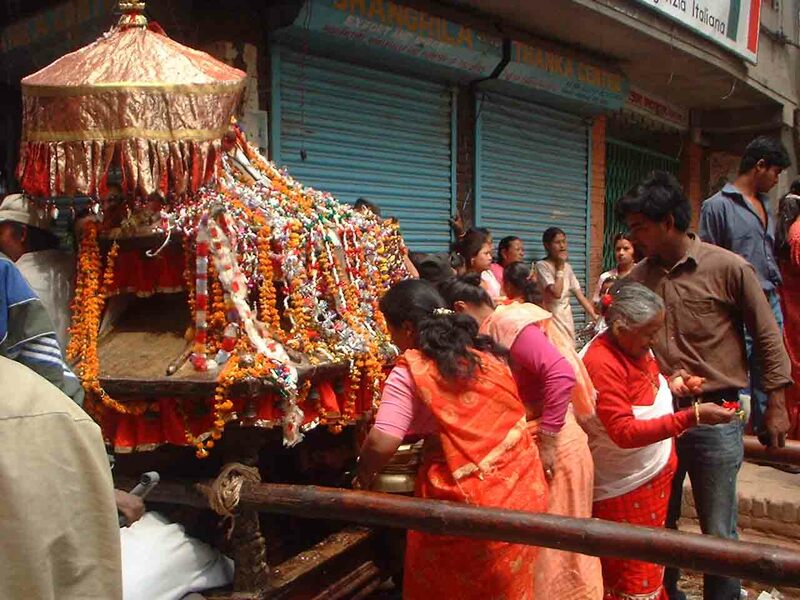 The city-dwellers are predominantly Newar. The ethnic Newar community was the outcome of ancient intermarriage between the Mongol and Aryan races. The Newar people dominated the Valley for most of its history; they created the beauty of its traditional architecture and plastic arts; they accumulated wealth through trade; and they established its reputation amongst the Himalayan peoples as a society small in size yet immense in human spirit. The remoteness and inaccessibility of the mountains, their awesome majesty, and the symbolic significance of their immutable mass have all contributed to their aura of divinity. In the lap of these mountains lies the Kathmandu Valley, a landscape charged with the presence of the divine. In this fertile and temperate valley the Hindu and Buddhist traditions of Nepal recognize numerous power places, i.e. focal points of divine energy -- where humans can make contact with the realm of the gods. Geomantic forces, divine myth, and human legend and history, combine to make these locations potent sources of spiritual revitalization and psychic renewal. The power places of the valley range from simple unhewn rocks and boulders revered since ancient times, to impressive pagoda temples replete with wood, bronze and stone sculptures. These sacred places where the energies of heaven mingle with the affairs of earth have been the goal of devout pilgrims from different spiritual traditions down through the ages. The main objectives are to make actual visits to selected power places (and supporting academic institutions) situated in both Nepal urban and remote hills areas. 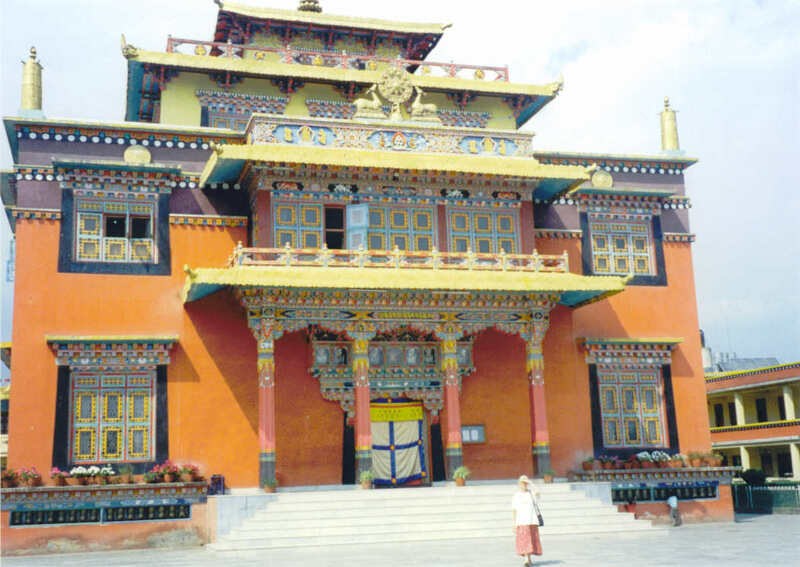 This will include some of the sacred sites related to the Guru Rimpoche Terma's tradition (Nyingma-Pa' s lineage of treasure seekers) and other retreat caves, Temples or Gompas (monasteries) in the Himalayan region borders with Tibet/China (TAR) and Sikkim (India). Fee: see fee options, including air fares and land costs while in Nepal, accommodation (based on two sharing) on half board basis (breakfast and dinner), lunch box on day excursions, sightseeing tours and trekking spots, entrance fees at monasteries and seminars, group supervision and translation. Fee does not include visa costs or Nepal trekking permit. Please enrol me/us for the above tour. Enclosed a deposit only of £200. For further information, including complete details of the package, overseas booking prices (USD and Euro's etc) please link below to CAIRN-NEPAL.